The European Central Bank is preparing a contingency plan for Greece leaving the single currency zone. According to Germany’s Spiegel magazine it looks at ways to keep the rest of the eurozone untouched. The magazine doesn’t provide any detail, other than saying that ECB is working on plans for Greece’s possible exit from the euro. On Friday, the Eurogroup is holding an extraordinary meeting in Brussels to agree on a loan extension for Greece. A lack of progress in talks between the new leftist government in Greece, that promised to end austerity, and the troika of international creditors have increased worries that Athens could exit the eurozone and possibly cause a ‘domino effect’, with Portugal, Spain and Italy following suit. "The Greeks have acted like elephants in a China shop," Guenther Oettinger, German EU Commissioner was cited as saying on Friday by the New York Times. "Now they slowly realize what the real numbers are. But they have already done quite a bit to sap the confidence of their European partners." On Thursday, Germany’s Finance Ministry rejected Greece’s request for an extension to its expiring bailout agreement. Greece’s Syriza government asked for a six-month loan extension for more time to renegotiate its €316 billion debt. At a meeting of eurozone officials on Thursday, German Finance Minister Wolfgang Schauble called the Greek proposal a “Trojan horse, intending to get bridge financing, and in substance putting an end to the current program,” the New York Times reports. Greece’s current bailout loan was agreed by the previous Greek government in 2012, totals €240 billion. The conditions of the bailout program, which include cuts in government spending, higher taxes are extremely unpopular in Greece. 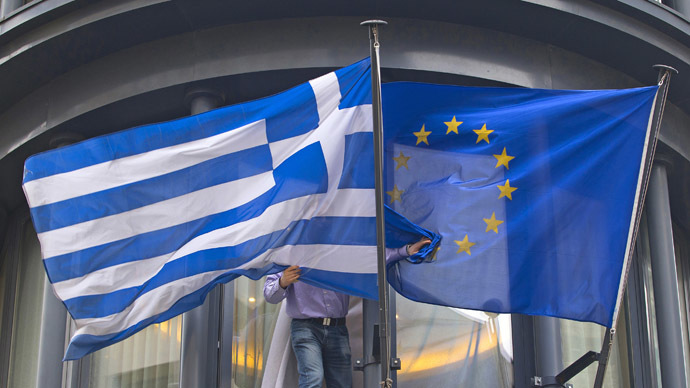 If the EU and Greece fail to reach an agreement Friday, according to a European Union official talking to Bloomberg, this would mean another round of talks on Sunday or Monday.